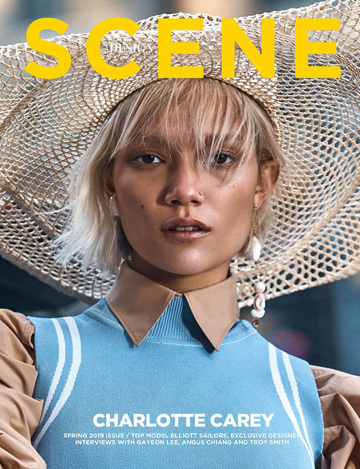 DESIGN SCENE cover star ALINE WEBER is a true definition of a modern day top model, Weber who started at an early age has more than a decade of covers, top runway shows and prestige editorials under her belt. The Brazilian top model sits down for an exclusive interview with our editor ANA MARKOVIC to talk about her favourite modeling moments, age regulations in the industry, and her passion for acting. When were you first discovered? I started my modeling career at an early age, I was first discovered in my hometown in Brasil at the age of 14. Soon after I flew to São Paulo and two months later I already started to travel and work internationally. You worked with so many great photographers and designers, what are the projects you are most proud of? I loved working with Tom Ford both for his movie “A Single Man” and also his lipstick campaign shoots. When it comes to runway I have to say opening for Balenciaga fashion show in Paris at the age of 19 was truly a huge turnout in my career. How different is the real modeling world, from the one you imagined before you started working? What are the biggest misconceptions about modeling and fashion industry? Being part of the industry since the age of 14, how much do you think it changed? I think a lot of things changed since the technology is advancing at such a rapid pace. For example when I did my first photo shoot the photographer was using film and to select a photo we would have to look with one of those loops to go through the film. Nowadays, with digital photography it is much easier in a way. Also now we have social media which is playing a huge role in the industry and in the world. I think we have to adapt to a lot of things and I don’t believe there is going back to the old ways. Hopefully, we’ll always be evolving. You appeared in Tom Ford’s “A Single Man” movie alongside Colin Firth and Julianne Moore. How was that experience for you? And did it spark your interest in acting? It was a great experience. Being in a scene with Colin Firth was a dream come true. He is one of the best actors out there. I’m very thankful for that experience and for the trust Tom Ford had in me. He is a great director and I’m sure he’ll have a lot of great movies to come. I did take some time off to study acting last year in NYC, will try to do that again at the end of this year. It is such a beautiful world and craft. And if I have the opportunity I would love to continue with some acting. My modeling experience helped in letting me feel more at ease in front of the cameras on the other side, the acting did help for building up characters in my photo shoots. Tell us about activism, what causes are the closest to your heart? I love animals and for a few years now I support an NGO in Brazil for abandoned animals. I also don’t wear fur for shoots anymore and I’m reducing anything related to plastic, I support small causes as well as I can. I think we all have a voice and should use it to influence things happening around the globe, it is very important that we give back to the world while we are here. You started at a very young age of 14, which at the time was the norm. What’s your opinion on girls modeling before they turn 18? Yes as we mentioned already, I started modeling at 14 years old and when I started there were no laws or age restriction when it comes to how old you need to be to walk in a show for example. I think the age regulations are a great move, 18 years old is an age when you are a bit more mature and ready to work and to travel the world. Brazil is such a big and beautiful country. I think the diversity we have in Brazil makes it special. There is a wide array of people from all over the world. So, what’s your favorite thing about your home town? My favorite thing about my homeland is the nature. I come from a country side town with lots of beautiful landscapes. On my days off I try to do everything that I enjoy. Like yoga, meditation and travel if I have more then a few days off. When I’m working I’m more focused on the job itself. So there is a balance and I think that is very important. No doubt when I’m doing things that I enjoy. Surely when I take care of myself is when I feel the most confident, more than when I’m just following a routine. I’m very laid-back on that. I like everything high wasted and also a bit hippie I would say [laughs]. Love to wear accessories with rocks, crystals and things like that. I do Pilates, Yoga and I’m a vegetarian. I try to be mostly vegan but sometimes I would have something which has eggs or dairy. I haven’t eaten pork or red meat for over 13 years and now fish and chicken for almost a year. It’s great! I love it! Find a good light. The first thing. I always love the light when the sun is going down, the famous golden hour. Also find a good angle of your face which can be very different from one person to another so find what’s best for you!